macaroni & cheese: Got Bread-baking woes?? While searching out some solutions for my friend's bread-baking issues, I found this web site. It's pretty rudimentary; nothing fancy about it. Just the facts, ma'am. But, BOY HOWDY, is it EVER a wealth of information!!!! I love it!! There's a whole list of terms and definitions, a HUGE troubleshooting page each for handmade bread, bread machine bread, and sourdough bread! You name it, it's here. All of your bread-baking problems are a thing of the past. 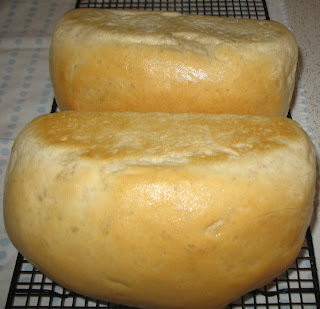 Also, check out my favorite, everyday bread, for bread machine, first posted TWO YEARS ago, today. Happy Anniversary, my bread!! Terrah, here's a no-machine recipe for ya! This recipe is fast and easy!! to make dinner rolls, grease a 12-hole muffin tin, and cut the dough into 24 pieces. Put two pieces per hole and continue w/ the recipe. I use it every time I want dinner rolls! I start them first, then make dinner and by the time dinner is done, so are the rolls!